A classic mint tea with the very finest peppermint. This product contains all-natural herbs, and no artificial colorings, flavorings or preservatives. "The aromatic Oregon- and Washington-grown peppermint we’ve selected for this tea tastes so fresh and delicious that it requires no accompaniment — it's the only ingredient here. 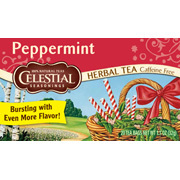 Once reserved for exclusive use in cakes and candies, the whistling cool freshness of pure peppermint from the great Pacific Northwest is yours to enjoy in this comforting brew." Peppermint Herb Tea - 40 bags is shipped in a discrete, unmarked package. Orders are processed immediately and usually takes about 3 to 5 working days to be received. We do ask that you try it for 2 to 3 weeks to feel the full effects. Any information received is used only for order processing and shipping purposes. Your information, such as e-mail address, will never be disclosed to a third party.